The farmers who own half of central Saskatchewan’s Gardiner Dam Terminal have reached a deal to sell their half to their business partner and wind up the company. Glencore Agriculture’s Viterra arm announced Friday it will buy the half of GDT it doesn’t already own and take over operation of the GDT inland grain terminal near Strongfield, about 100 km south of Saskatoon. The deal also calls for Regina-based Viterra to sell GDT’s three GDT AgServices crop input retail outlets, at Strongfield, Broderick and Tullis, Sask., to central Saskatchewan’s Riverbend Co-operative for an undisclosed sum. Both deals are expected to close on or around Dec. 19, pending approval from GDT shareholders at a meeting scheduled for Dec. 13. More details of the deal are due to go out to GDT shareholders in a circular on Monday, but GDT said Friday it expects to receive between $27.9 million and $30.25 million in aggregate proceeds. From that, each GDT shareholder is estimated to get one or more dividends worth a total of between $1,175 and $1,275 per share, once the GDT business is wound up and the costs of the sale, wind-up and other liabilities are paid out. GDT’s board “has been working diligently over the past year to allow our shareholders a way to capture the value created by 18 years of success and prosperity,” board chairman Ron Bartel said in a release. 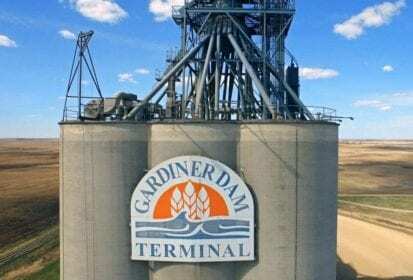 Gardiner Dam Terminal was set up in 2000 as a joint venture between area farmers and Agricore, which later merged into Agricore United and eventually Viterra. The terminal, about five km south of Strongfield, is on Canadian Pacific Railway track and today has grain handling capacity for about 27,160 tonnes. GDT in 2013 bought out Viterra’s 50 per cent stake in the joint venture’s ag retail operations, which now operate as GDT AgServices, a wholly-owned GDT arm. Ultimately, GDT said Friday, the company’s management proposes that both GDT and GDT AgServices be wound up and dissolved — a move its shareholders would have to approve at a later date. Employees at the Strongfield grain terminal will be offered the opportunity to join Viterra, while staff at the GDT ag retail stores will be offered jobs with Riverbend Co-op, Viterra said in its own release. “This is an exciting opportunity for our co-op to significantly increase our presence in the ag sector in central Saskatchewan,” Riverbend Co-op general manager Greg Sarvis said in a separate release. The Outlook, Sask.-based co-op already deals in bulk fuel and ag equipment from its Co-op Agro Centres in Outlook, Davidson, Beechy and Wiseton and six cardlock fuel sites.